Sleek, chic and over-the-top contemporary describe this table top cappuccino finish veneer of MDF and metal pub table. The bar-counter height is perfect for standing at and having a conversation or match with our Air-Lift Stools for a cozy chat or small dinner. Lots of possibilities with this versatile table and it s small enough to fit most anywhere. Wood Veneer Top, MDF, round table top has surface area of 23.66" Square and stands at 39.76" High. 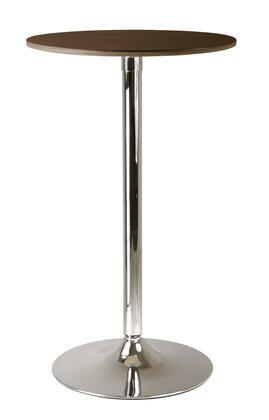 Bright Chrome Metal Finishing on Post and Base. Base has a diameter of 17.52". Easy Assembly Required. Match with our Air Lift Stools to complete the look.